Mrs. Chow's Kitchen » Post Topic » Blizzard on the Way. Time to Bake More Bread! Blizzard on the Way. Time to Bake More Bread! We are expecting 12 to 22 inches of snow in the D.C. area, so I managed to get to the gym this morning because that much snow means we won’t be going anywhere for a few days. The main roads will be plowed, but not all the back roads in the residential areas, and I drive a Honda, not a Hummer. As I mentioned in my previous post, I’m playing catch-up with the Bread Baker’s Apprentice (BBA) Group, which is baking its way through The Bread Baker’s Apprentice: Mastering the Art of Extraordinary Bread , and my latest entry is Italian Bread. 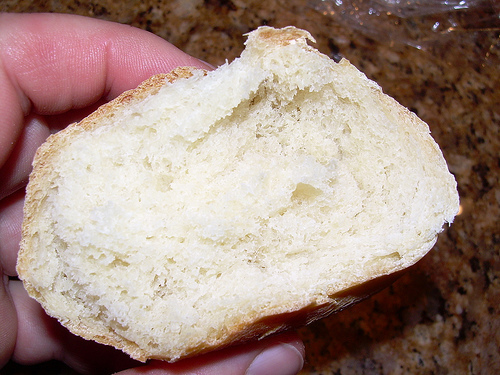 The bread is made with a pre-ferment known as a biga; I held it in the refrigerator for two days before I baked the bread, and I think that contributed to the flavor. Once again, it doesn’t look too pretty, but my batard-shaping skills are improving, and this bread was very tasty – great texture and a subtle tang to the flavor. My husband really liked it, and thinks it should go on my “repeat” list. You can see what everyone is making this week at our Flickr group, on Twitter (#BBA), or check out the challenge page. To see what yeasty goodness others have made in their kitchens this week, be sure to check out Susan’s weekly YeastSpotting! I had to comment because we have two of the “Sun Gods” – and my min pin is parked in front of it right now! 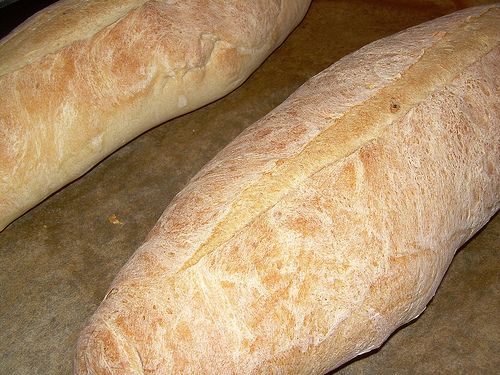 Gorgeous bread, but those puppies have won my heart! Well, then, I guess I need to bake some bread, cause it snowed here today. Yours looks terrific, I’ll be it would be awesome made as garlic bread toasted under the broiler. Oh, and the doggies are so pretty, love that curly fur. 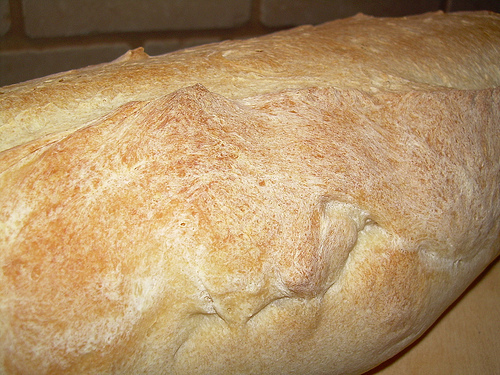 The Italian bread is one of my favorites. I really need to get my post done! 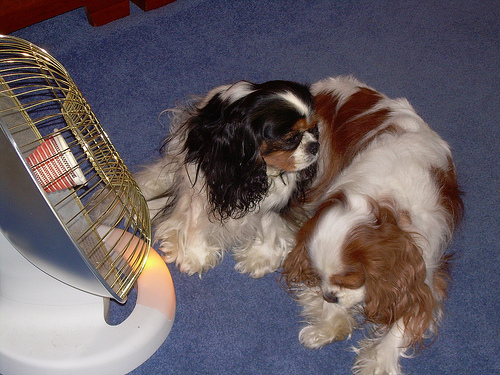 =) I hope you and the pups are all snuggled up inside today. Two of my sisters live in DC; I haven’t had a chance to talk to them to see just how much snow they got (they both live in the city).